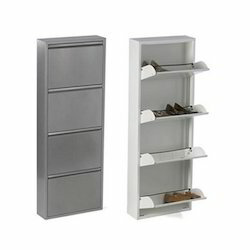 We have a wide varieties of wall mounted metal shoe rack in different color. 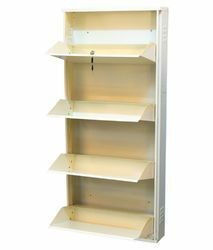 Srg shoe rack are made from high quality Ms steel and then further powder coated with 7 tank powder coating process which ensure the best quality of the product. 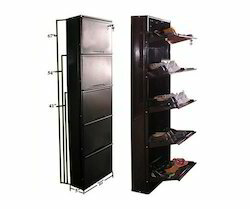 SRG International is Manufacture, Supplier, Distributor and Dealer of Steel Shoe Rack. Our valued patrons are offered a wide gamut of Shoe Rack that is designed for unmatched convenience and impeccable storage of footwear. These are can be availed in different designs and are made from the best grades of metal alloys for longer service life. We use cutting edge technologies to manufacture these racks by ensuring rigid compliance to preset industry norms of quality. These racks have been powder coated for long lasting finish and can be availed in different specifications at reasonable prices. 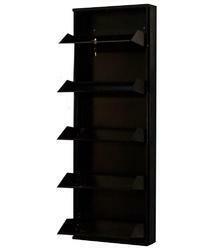 SRG International is the leading manufacturer and suppliers of 4 Door Wall Mounted Shoe Rack. SRG International are the leading manufacturer, Supplier, Distributor and Dealer of 5 Door Shoe Rack. 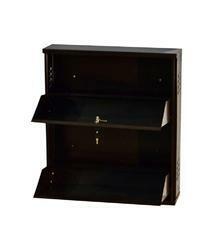 We are the leading manufacturer and supplier of 3 Door Shoe Rack. 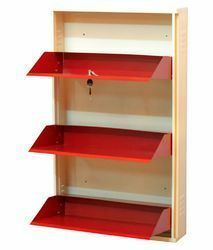 We are the leading producer and supplier of 2 Door Wall Mounted Shoe Rack. We are the leading producer and supplier of Shoe Display Rack.